Custom Printed Faux Wood UV Sunglasses are a fantastic promo item for the promotions of furniture stores, travel companies and also other outdoor events. These custom sunglasses are providing UV400 protection and are available in Tan color only. The 2" x 3/8" imprint space in these plastic custom novelty sunglasses can make your promotions achieve good brand impressions. They are coming in one size fits most adults. Order now to grab our free digital proofs and free custom design services. 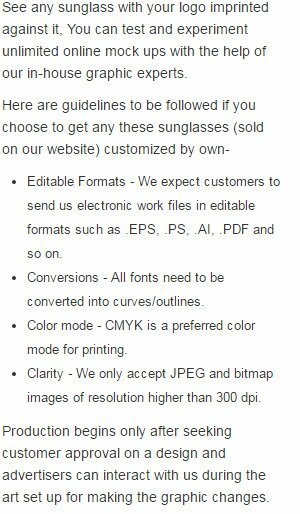 Request a quote to know what you can save on ordering Custom Printed Faux Wood UV Sunglasses.